The 10 Best Mini Golf Courses in Michigan! Nothing compares to the classic, wholesome fun of a mini golf course. Michigan has its share of excellent choices when it comes to mini golf, so let’s grab our putters! 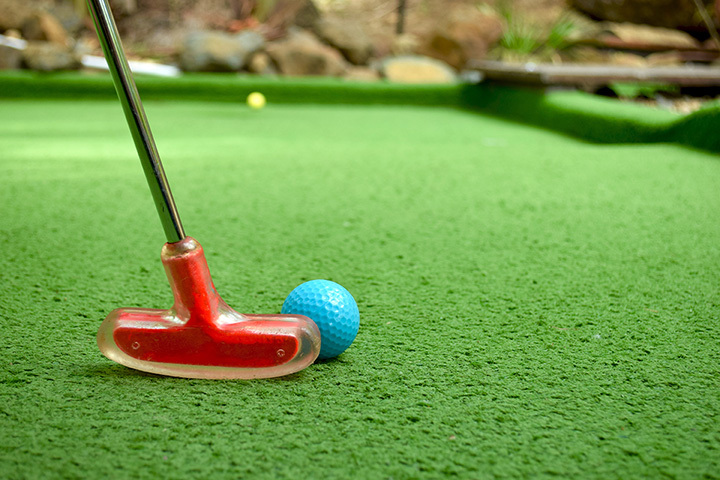 Check out the 10 best mini golf courses in the Great Lake State! Holland's the Lost City offers a mini golf experience that's great in all weather. Why? Because it's indoors! Featuring a nine-hole course that's been recently remodeled to include a slate of exotic themes—desert, tropical, and a hole that seems to be a homage to the Nile River complete with crocodiles—it's a great way to get your short game up and running in any conditions. Best of all is the last hole, which is set up like the classic “The Price Is Right” mini-game Plinko, where getting the ball in the center slot awards customers a free game. Perhaps Grand Rapids' most iconic miniature golf option, Craig's Cruisers offers a fairly complete package of events. With laser tag and go-karts well in hand, Craig's Cruisers also boasts some exciting mini golf action as well. Throw in some impressive specials like unlimited play on Wednesdays and you've got one of the biggest reasons that Craig's Cruisers is a major mini golf destination in Grand Rapids! Comparatively small Niles plays host to Hacker's Golf and Games, which offers a little something unusual: natural grass. No, really, natural grass on a miniature golf course! Featuring 18 holes complete with fountains and a lazy river, this course covers a lot of ground. With go-kart tracks and batting cages on hand as well—plus a PGA professional offering lessons—the end result is a great variety in the middle of small-town Michigan. Dorr's Dairy Ranch has an ice cream shop right on premises. The Dairy Ranch is an absolute classic when it comes to mini golf and will feel like you’re taking a step back in time. The combination of mini golf and easily-available ice cream comes together to make a great value for its players. Not surprisingly, Traverse City has miniature golf, and several options therein. But Pirate's Cove offers plenty extra, starting with two separate 18-hole courses. Throw in the extras—like a zip line ride, a ropes course, go-karts and bumper boats—and you've got a staggering array of things to do. There's even an annual event called Putting for Patriots, which offers support for a variety of charities via miniature golf. Muskegon is well known for its recreational opportunities, and Putters Creek will be one of several opportunities the city offers. Featuring not only miniature golf, but also go-karts, Putters Creek has a lot going for it by itself. Throw in its proximity to campgrounds, Lake Michigan and the biggest amusement park in Michigan—Michigan's Adventure—and it's a valuable offering both for what it offers, and what it's adjacent to. While the Joe Dumars Fieldhouse has a variety of sports activities and clinics, even some camps available, it's also home to some impressive miniature golf right in Auburn Hills. Containing the Bayou Fun Center, it's home to a nine-hole indoor mini golf course called Bayou Golf. Sometimes called the Swamp, it's got ponds, waterfalls, and actual Louisiana-native vegetation to round out the “bayou” experience. Since it's indoors, it works well in any season. Miners Falls Mini Golf represents one of the best opportunities for miniature golf in the Upper Peninsula. Found in Munising, the course offers a nice challenge yet one that even comparative beginners regard as accessible. A variety of course types is involved here, with fountains and hills involved. Throw in some ice cream to soothe a loss or cheer a victory and you've got a recipe for a full day's fun. Ypsilanti's Putterz boasts a wide array of options, with three complete 18-hole courses to choose from for a grand total of 54 holes. Featuring hills, curves, and even a downright classic windmill hole, the result is a wonderfully varied mini golf experience. Few mini golf courses just offer golf, and Putterz is no exception. Check out the batting cages and one of the last few arcades you'll see in the wild to round out the experience. Lansing's Zap Zone represents the kind of experience that most 12-year-olds go crazy for. The “Glo Golf” section of Zap Zone offers indoor miniature golf complete with a variety of themes, ranging from a New York-style street to an underwater hole. Finishing the course in a “lost world” packed with dinosaurs rounds out the experience, and then opens you up to check out things like the “Spin Zone” simulator packed with flips and rolls, the indoor bumper cars, a complete teddy bear creation lab and even one of the last arcades around, it's a complete day's worth of fun and then some.